Flemish (possibly French) painter, copyist, collector and dealer, active in England. In 1635 he was living in the newly developed area of Covent Garden, London; at that time he was closely associated with Anthony van Dyck and presumably assisted in his studio. Through his varied activities, van Leemput became a leading figure in the London art world, and he assembled a major collection of paintings and drawings. He bought extensively when Charles I s collections were sold in 1649-51; his purchases included works attributed to Titian, Giorgione, Correggio and Andrea del Sarto. Later he acquired the great equestrian portrait by van Dyck of Charles I with M. de St Antoine (British Royal Collection), which he apparently attempted to sell in Antwerp but asked too high a price. It was still with him at the Restoration in 1660, when it was recovered from him for Charles II. 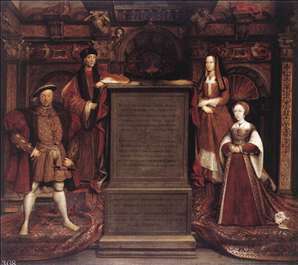 See more details about "Henry VII, Elizabeth of York, Henry VIII, and Jane Seymour"